Using egg as a binder for applying pigments had its beginnings in Byzantine icon paintings of the 4th C. Egg tempera remained the principal medium for over 1000 years until oil paints came onto the scene. Pigments used were first collected from nature — earth, plants, insects and minerals — then ground. Though most pigments are now manufactured, the basic technique described here would be familiar to any panel painter of centuries ago. uses egg yolk as an agent to bind colored pigment to the wooden panel. People often assume that the bright yellow color of the egg will affect the color of the paint. In fact, egg yolk is an emulsion that dries crystal clear, with any bits of color disappearing as it's exposed to light. To prepare the pigment for a panel, the first step is to separate out the yolk, as the percentage of albumen in the white is too low and will not bind the paint well. To start each session, crack a fresh egg and drain off as much of the white as possible by passing the yolk back and forth between the half shells, taking care not to break it. Then transfer the yolk to the palm of your hand, and move it from palm to palm, drying your hand between each transfer. When the yolk feels dry, hold it very gently between your thumb and index finger, pierce the sac and allow the pure yolk to drain into a clean cup. Once the contents are drained, discard the yolk sac. 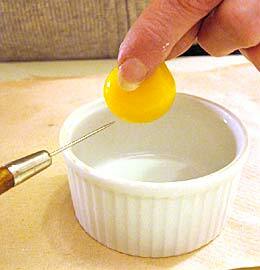 Since the yolk is rather thick, a few drops of water are added to thin it slightly and reduce its greasiness. This mixture of egg yolk and water is the binder for all of our colors. without inert fillers, are mixed with the egg to create your palette of colors. Have ready in individual cups small amounts of pigments in each color needed for your panel. 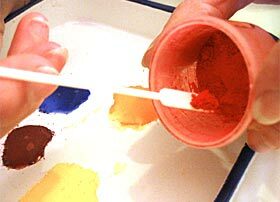 Using a spatula, measure out only a tiny amount of dried pigment onto the palette to prepare the first color. Preparing a small amount at a time is essential. Since the paint dries so quickly and will form a film that cannot be restored, avoid mixing large puddles of paint on your palette. If you're mixing two or more colors together to achieve a certain hue, make sure to note the mixture as you will likely need to mix more. 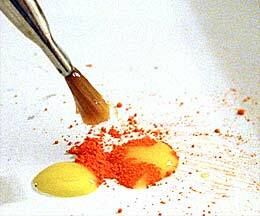 a bit of yolk and drop onto the palette an amount approximately equal to the amount of pigment. Stir these together to create a smooth, creamy paint. 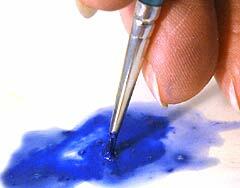 Some granier pigments need to be mixed longer to make sure there are no lumps. Though you always start with a half-and-half-mixture, you can test the proportion by stroking the paint onto a panel. If the paint leaves a dull, chalky surface when dry, you'll need to add a bit more egg. An overly shiny surface means you'll need to add more pigment. The optimal mixture should result in a slightly shiny surface when the paint has dried. Proper technique is something you'll learn with practice. Don't mix too much color at one time, rather measure out more pigment as you work, adding egg to it as needed. the paint, allowing the artist to lay transparent glazes by moving the brush quickly and freely over the gessoed surface. In tempera, the paint is not pushed into place as with other mediums, but rather built up in layers that must dry quickly so each succeeding coat does not disturb the previous layers. Once you have the tempera mixture smooth and adjusted to the desired color, add as much water as needed in order to thin the paint to the desired transparency. The amount of water added will not change the hue nor other important properties of the paint. thin and nearly transparent glazes laid on top of each other until the desired color, saturation and shadows are achieved. 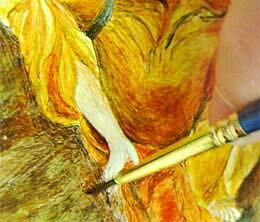 This is necessary because egg tempera dries quickly and cannot be blended once applied. Since the paint is applied in a very precise way, we use a selection of tiny, round brushes, from size 1 down to 20/0 (only several hairs) depending upon the desired level of detail. You'll apply the paint first to the farthest background area (the farthest plane, such as the sky) and work forward. This helps create smoother edges on objects in the foreground, since these edges can slightly overlap elements that lie behind. Begin by dipping your brush into the thinned paint and then run it lightly over a paper towel or the back of your hand to remove any excess. Painting with an almost dry brush is important since excess paint can leave a tiny bead when the brush tip touches the surface. Using too much paint also causes the end of each stroke not to be flat, and you'll be left with small bumps which will remain visible through succeeding layers, ruining the smooth surface and even tone of the panel. Paint is applied to the panel in a series of strokes — similar to the way you'd use a pencil — with just the very tip of the brush. Each glaze is laid down quickly with strokes all going in the same direction. If painted properly, the glaze will dry in seconds, allowing you to apply the next layer. tempera process, as this allows the characteristic, luminous quality of the painted panel to develop. As each glaze is laid, its opacity and transparency are affected by underlying coats as light passes through each layer and is either absorbed or reflected back to the viewer. To lay successive glazes, mix paint of the desired hue and value, and again apply strokes in one direction, but which run at an angle to the previous layer. Continue building crosshatched glazes this way (using one color or alternating colors) adding depth to the painting. It's not unusual to lay ten or more glazes before the proper color and shading is achieved. dries to an insoluble, permanent surface, the paint is not entirely waterproof when it first dries. Therefore, be careful not to lay any glaze too wet, as this will not only defeat the luminous effect of layering, but possibly cause underlying layers to come off the panel, leaving an area of unpainted gesso. Techniques of painting specfic elements, such as fabrics and flesh, is beyond the scope of this tutorial. But, in general, each color you work with will be prepared in at least three values — dark, medium and light. After an area is painted with its base color, the other values are used in succeeding layers, first to create the shadows and then the highlights. of mediums. If you're not pleased with a painted effect, you can scrape off all layers down to the bare gesso surface and start again. This is a great benefit for the beginning tempera artist — since the cumulative effect of mixing paint, crosshatching and layering can only be learned through experience, the ability to rework and improve sections of a painted panel is invaluable. The paint is removed with a pointed stylus, held at an angle to the panel. Taking care not to scratch into the gesso, gently scrape with an edge of the metal tip. Once the paint is removed, use a piece of cotton to brush off the bits of paint leaving you a clean, smooth surface to repaint. There are are a number of additional techniques used to achieve interesting effects on a tempera panel. One technique, known as stippling, can create a texture on painted areas. This is usually done with either a sea sponge or a piece of bunched plastic wrap. Dip this into the paint and remove the excess by gently pressing it onto a paper towel. Lightly dab the sponge or plastic wrap onto the already painted surface area to which you want to add texture. To build up texture, dip the tool into the same or a different color of paint and gently work over the area again, until you achieve the desired effect. Another technique, sgraffito, is often used to add a golden pattern to an area of painted fabric. This requires laying gold leaf (while gilding the panel) beneath an area that will later be painted. 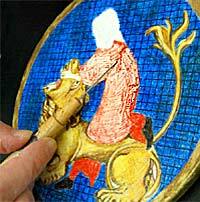 During the painting process, glazes are applied over the gold to build up the desired color. 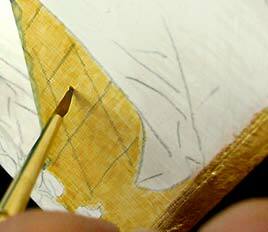 When thoroughly dry, using a wooden manicure stick, gently etch out the pattern, exposing the gold below. Make sure to scrape gently so as to not disturb the gold leaf. The result is a painted fabric with a golden pattern incorporated into it.